Heavy Metal (Columbia, 1981) Folded, Near Mint. Mini Poster (18" X 24.5") Advance, Chris Achilleos Artwork. Animation. Starring the voices of John Candy, Caroline Semple, John Vernon, Eugene Levy, Joe Flaherty, Harold Ramis, Alice Playten, Richard Romanus, and Don Francks. Directed by Gerald Potterton and Jimmy T. Murakami. 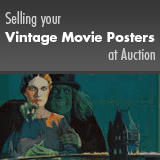 A very lightly used, unrestored poster with fresh, saturated colors. In folded posters, the most minimal wear at the folds is acceptable. The poster should have no holes, no tears, and no paper loss. Folded, Near Mint.